It’s wonderful trip!! It is organised by Bali Hai Cruises. There are two of us! It’s my gift for my friend as the day of her birthday! It’s the best birthday gift ever for her!! We got picked up around 5:50am which is very proper given that we stay in Ubud. The driver is very nice and we have a smooth trip to the harbour. We were offered simple breakfast. My friend didn’t take it as she afraid there will be seasick, which never happen later. We got explanation and introduction by the cruise driver and the life jacket and seat belt. Our trip to the Bali Sea with fast boat is like roller coaster yet not scary, we got used to the water bumping at one point. 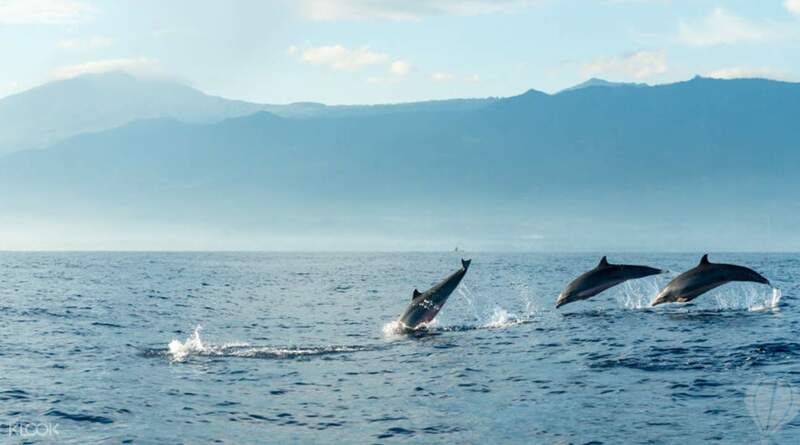 When arrived to the middle of the south Bali Sea, the cruise driver scream saying that there’s a lot of dolphins, and stopped the boat. We filmed all the while for 40mins fully dolphins experience and sometimes jumping dolphins and being woooo and wooow from us ! Sharing here good photos of the dolphins and we have more !! It’s exclusive and no other boat around us, so we are totally free to be with the dolphins without scaring them. Total experiences is amazing! It’s wonderful trip!! It is organised by Bali Hai Cruises. There are two of us! It’s my gift for my friend as the day of her birthday! It’s the best birthday gift ever for her!! We got picked up around 5:50am which is very proper given that we stay in Ubud. The driver is very nice and we have a smooth trip to the harbour. We were offered simple breakfast. My friend didn’t take it as she afraid there will be seasick, which never happen later. We got explanation and introduction by the cruise driver and the life jacket and seat belt. 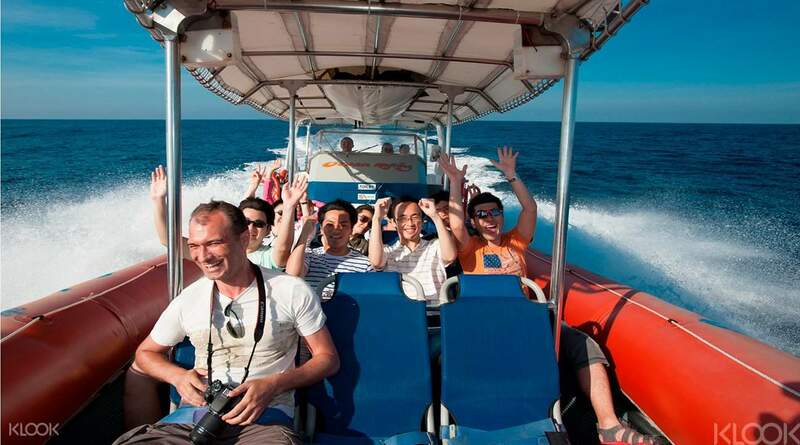 Our trip to the Bali Sea with fast boat is like roller coaster yet not scary, we got used to the water bumping at one point. 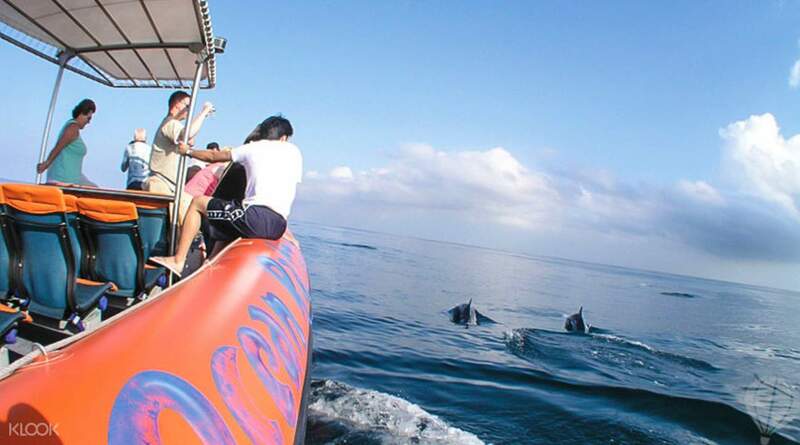 When arrived to the middle of the south Bali Sea, the cruise driver scream saying that there’s a lot of dolphins, and stopped the boat. We filmed all the while for 40mins fully dolphins experience and sometimes jumping dolphins and being woooo and wooow from us ! Sharing here good photos of the dolphins and we have more !! It’s exclusive and no other boat around us, so we are totally free to be with the dolphins without scaring them. Total experiences is amazing! not for the faint hearted. there is nearly a hour of water rafting before we reach the dolphin watching spot. able to spot dolphins even there is only a few. not for the faint hearted. there is nearly a hour of water rafting before we reach the dolphin watching spot. able to spot dolphins even there is only a few. We didn't get to see the dolphins due to the rain and rough seas. I must say the boat ride out was exhilarating like a roller coaster ride! Fun and bumpy! But if you feel insecure you can always belt up with the seat belts. Beach towels were provided to shield us from the rain. I opted for the dinner cruise as replacement. The drivers were very on time and I appreciate how they ensure that we are on schedule. However, there was quite a long wait before we left the dork and there wasn't much to do. Food was alright, service crew only attends to caucasians, the band performed pretty well. Would have been perfect if they could work the crowd. The shows were entertaining and following which we were given our time to dance at the dance floor. Oddly, the party died down as soon as it started. We didn't get to see the dolphins due to the rain and rough seas. I must say the boat ride out was exhilarating like a roller coaster ride! Fun and bumpy! But if you feel insecure you can always belt up with the seat belts. Beach towels were provided to shield us from the rain. I opted for the dinner cruise as replacement. The drivers were very on time and I appreciate how they ensure that we are on schedule. However, there was quite a long wait before we left the dork and there wasn't much to do. Food was alright, service crew only attends to caucasians, the band performed pretty well. Would have been perfect if they could work the crowd. The shows were entertaining and following which we were given our time to dance at the dance floor. Oddly, the party died down as soon as it started. It is an amazing experience to see wild dolphins swimming in groups and jumping and spinning in the ocean. Though the boat ride was a bit tough due to the rough sea, it was such an unforgettable experience that I would definitely recommend to others. 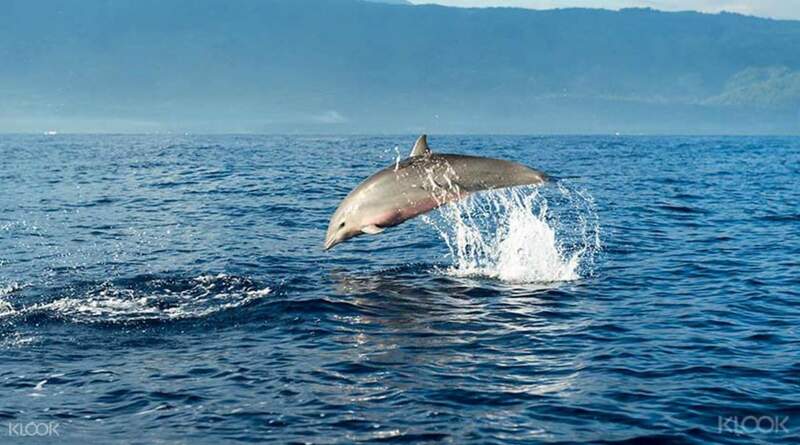 It is an amazing experience to see wild dolphins swimming in groups and jumping and spinning in the ocean. Though the boat ride was a bit tough due to the rough sea, it was such an unforgettable experience that I would definitely recommend to others. The boat trip itself was exciting for us land lubbers - up to 50mph! And when we'd seen 3-4 black backs cresting and tails ("false whales") we were pleased. And then we saw 30-40 spinner dolphins at a time, playing, flocking like birds - it was wonderful. Informative leaflet, and helpful staff in spotting and chasing and pointing. Do it early in your stay, just in case you're unlucky, as they'll book you on again free if you don't see any. The boat trip itself was exciting for us land lubbers - up to 50mph! And when we'd seen 3-4 black backs cresting and tails ("false whales") we were pleased. And then we saw 30-40 spinner dolphins at a time, playing, flocking like birds - it was wonderful. Informative leaflet, and helpful staff in spotting and chasing and pointing. Do it early in your stay, just in case you're unlucky, as they'll book you on again free if you don't see any. It a good experience for me and my partner despite getting seasick. It was the 1st time we saw schools of dolphin swimming so near to our boat! 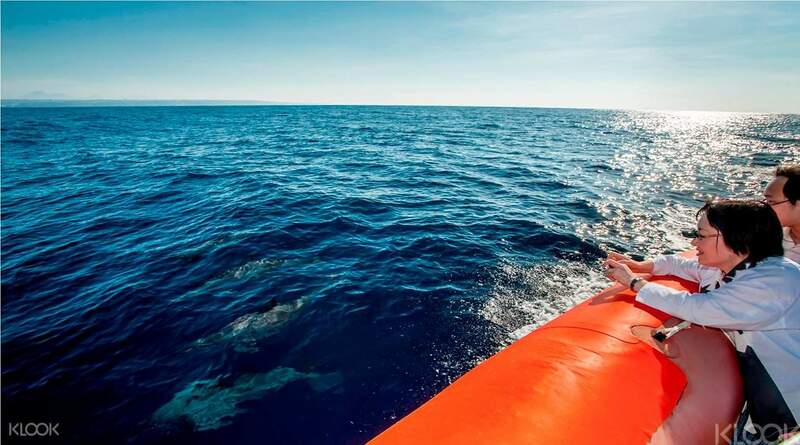 Although we're afraid that our watching activity would harm the dolphin, but appraisal to the boatman who aware of the dolphins and stopped his motors. It a good experience for me and my partner despite getting seasick. It was the 1st time we saw schools of dolphin swimming so near to our boat! Although we're afraid that our watching activity would harm the dolphin, but appraisal to the boatman who aware of the dolphins and stopped his motors. Big wave and nice and exciting ride on the boat and good talk and safety ride too, and about dofin good too, it can say bonus give when go out to find it. Big wave and nice and exciting ride on the boat and good talk and safety ride too, and about dofin good too, it can say bonus give when go out to find it. The weather wasn’t too good so the captain decided that we return to the port. We weren’t able to see the dolphins but the Company offered for another free ride or a buffet dinner in their cruise ship (depending on your available schedule and stay in Bali) in exchange. It was my last night in Bali so I opted for the buffet dinner instead. The dinner was fine and would still recommend this package. The weather wasn’t too good so the captain decided that we return to the port. We weren’t able to see the dolphins but the Company offered for another free ride or a buffet dinner in their cruise ship (depending on your available schedule and stay in Bali) in exchange. It was my last night in Bali so I opted for the buffet dinner instead. The dinner was fine and would still recommend this package.